The three chiefs (Seated L – R), Chief Hamusonde, Chief Ntambu and Chieftainess Mwewezwa. In the back row are (L – R) Mr. Joseph Maopu,Mr. Joseph Kawang’u, Deputy High Commissioner Ms. Philomena Kachesa, First Secretary in charge of Protocol Mr. Mungongi Samutete, Mr. Emmanuel Kasanga, and First Secretary in Charge of Administration Mr. Howard Chikontwe. THREE Zambian chiefs are in South Africa to consult their counterparts on best practices of how a combined local government and traditional leadership system operates. This has been necessitated by the new law in the amended Zambian constitution which now requires that three chiefs from each district should be part of the council. According to the statement released to the media by Press Secretary at the Zambian Embassy in Pretoria, Nicky Shabolyo, the chiefs will take advantage of their presence in South Africa where they are attending the 2016 Africa Traditional Leadership Summit, to engage the Royal Bafokeng of North-West Province and the Zulus of Kwa Zulu-Natal Province. The meetings with the Royal Highnesses of the two provinces of South Africa are meant to help the Zambian delegation appreciate progressive traditional and local governance systems that are being practiced in South Africa by traditional leaders in uplifting living standards in chiefdoms. It is also hoped that in view of the new requirement in the Zambian constitution, the visits will enable the chiefs interact with the local traditional leadership system and exchange ideas on how the South African systems have been working with local government/councils. The three traditional leaders, Chief Ntambu of Mwinilunga District who is Chairperson of the House of Chiefs, Chieftainess Mwewezwa of Itezhi-tezhi District and vice-chairperson of the House of Chiefs, and Chief Hamusonde of Monze District who is member of the House of Chiefs are in South Africa to attend this year’s Africa Traditional Leadership Summit which run from today until 28th October, 2016 in Johannesburg. The Royal Highnesses are accompanied by Committee Clerk of the House of Chiefs, Mr. Joseph Kawang’u; Chief Planner in the Ministry of Chiefs and Traditional Affairs, Mr. Emmanuel Kasanga, and Mr. Joseph Maopu who is Principal Chiefs Affairs Officer in the Ministry of Chiefs and Traditional Affairs. Chief Ntambu explained that the summit is meant to discuss the role of traditional leaders in today’s democratic governance system and also discuss approaches on how chiefs can contribute effectively in developing the communities which they lead. He said the Summit was an important event from which Zambia should not be left out particularly that it will also serve as a launch pad for the SADC Council of Traditional Leaders. 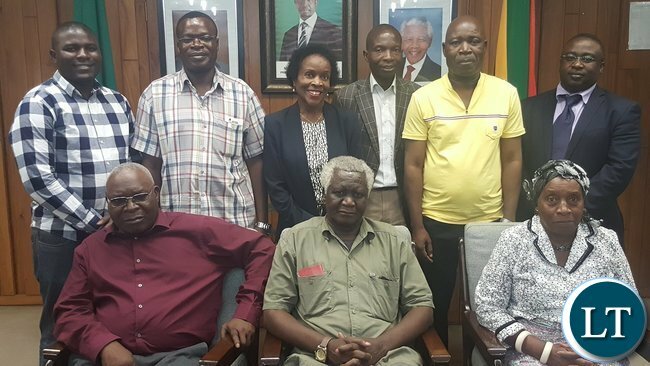 Chief Ntambu was speaking when his delegation met Zambia’s Deputy High Commissioner to South Africa, Ms. Philomena Kachesa and diplomatic staff at the Zambian High Commission. Ms. Kachesa concurred with Chief Ntambu pointing out that it was important for traditional leaders to interact more. She said the High Commission will keenly follow the meetings that the Zambian delegation would be involved in. Rubbish..what consultation..those are PF cadres!!!!!! Useless upnd demagogues! Is it because all the chiefs are from upnd strongholds you are commenting like that?